Chances are, if you are developer, you have used the terminal before. If not, you should. 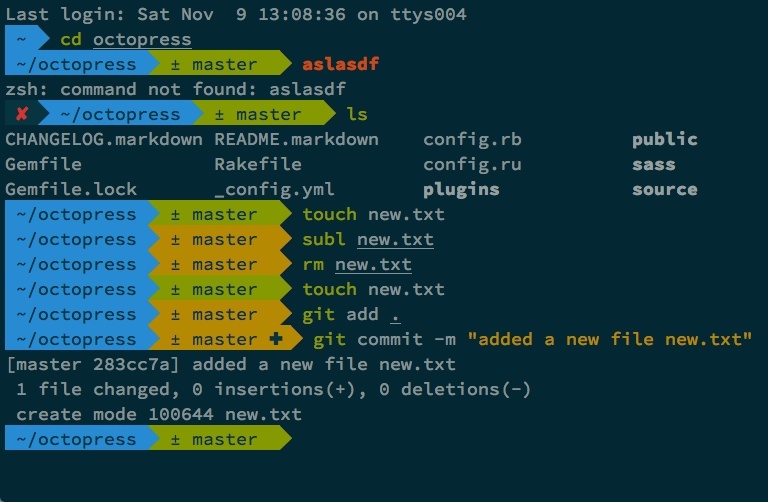 From version control tools like git to ssh, there are numerous reasons to use the terminal to make your life easier. Also becoming familiar with the command line will only help you later on when you graduate to managing your own Linux server. OS X comes with a default terminal client which uses bash and honestly isn’t all that user friendly. I have ditched it in favor of iTerm (a terminal client) and Z Shell (ZSH – a command line interpreter). ZSH has some powerful features like prompted typo correction, autocompletion, and prompt customization. ZSH also boasts a long list of plugins which can help you manage your git repositories, highlight syntax errors, and launch text editors from the command line. Plus, lets be honest, it looks really cool. After you have unzipped the file, move the application into your applications folder and start it up. When you open it, it will seem very familiar to the default terminal program. If you open the application preferences, you will see a variety of customization options. You can even import custom color schemes. Under Profiles > Terminal, make sure the Report Terminal Type is set to xterm-256color as shown in the image below. To make managing your ZSH configuration easier, I recommend using oh-my-zsh, an open-source framework. The installer should run automatically. Restart iTerm to launch a zsh terminal. ZSH will load the config file and you should see the theme load. It may look different than the image you saw in the theme preview. We still need to setup our color scheme and font. 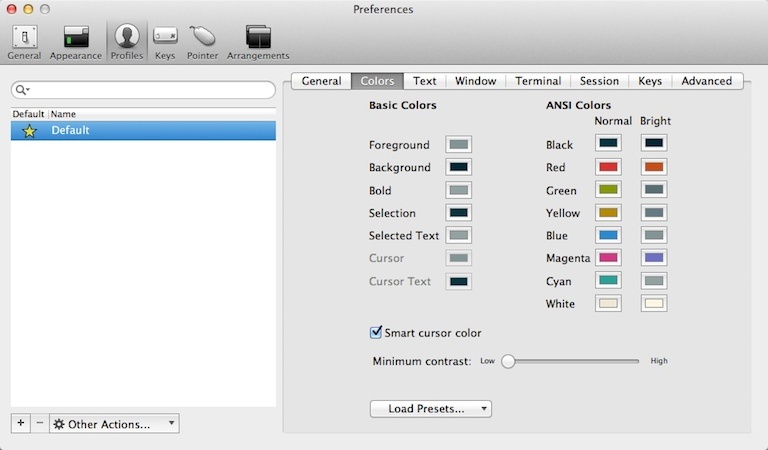 To change the color scheme, in iTerm go to Preferences > Profiles > Colors. Click on the Load Presets button to load a preset color scheme. If you have the Solarized Dark color scheme already, simply select it. If not you can find it here: Solarized Color Scheme. Once you download and extract the files, back in the Load Presets option in iTerm, click Import. Navigate to the directory where the extracted files are and find the iterm2-colors-solarized folder. Inside this folder you can select the themes and click Open to load them. Now select Solarized Dark as the color scheme. Now that we have the colors setup we need to change our font. If you dont have a powerline patched font installed you can find the fonts here: Powerline Fonts. The easiest way to install the font is to download the zip file. 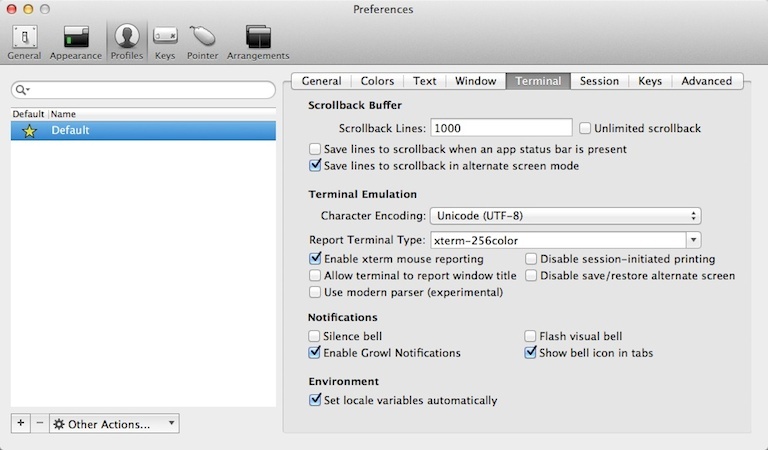 Once you have extracted the contents, in iTerm go to Preferences > Profiles > Text. You will see fonts for Regular and Non-ASCII font. Click on Change Font. The fonts window will open up. In the fonts window, you will see a cogwheel icon for settings. Click on this and then choose Manage Fonts. 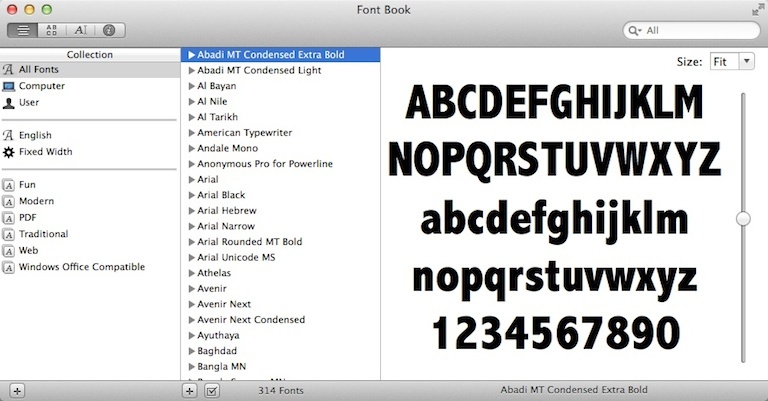 The fontbook window will open and you will see a screen similar to the image above. Click on the plus symbol towards the bottom middle of the window (not the one on the far left) to add fonts. A browse window should open and you simply need to navigate to the directory where you extracted the powerline fonts. You can select all of the subfolders in the window and click Open to add them all at once. After the fonts have been added, close the fontbook window. Back in the fonts window for iTerm, you can now select powerline fonts. Hint: You can use the search field and type powerline to view only the powerline enabled fonts. Select Source Code Pro for Powerline for both font options. I use 18pt, but you can use whatever size font you would like to. The zsh terminal should now render correctly and you should see something similar to the image below. If you dont see the yellow or green portion, it is because you are not in a directory that is part of a git repository. Navigate to a git repository and you will see either a yellow or green arrow next to the directory listing. Yellow is for repositories that have uncommited changes, and green is for a repository that has no uncommited changes. You should now be familiar with what it takes to customize oh-my-zsh now. You can edit the config file again to make changes or to add additional plugins. You can also add aliases (shortcuts) in the config file. To read more about oh-my-zsh, checkout the github page. Be sure to lookout for my next post, Adding a Custom Plugin to oh-my-zsh, sometime next week. If you run into trouble, reach out in the comments section or email me.